Baseball players are among the highest paid athletes in the world, with salaries so astronomical that they are hard for even the most mathematically inclined fan to keep track of. That’s where Cot’s Baseball Contracts comes in. The website, which is named for Cot Tierney, the National League’s fifth leading hitter in 1922, is the one stop clearinghouse for all things baseball contract related. 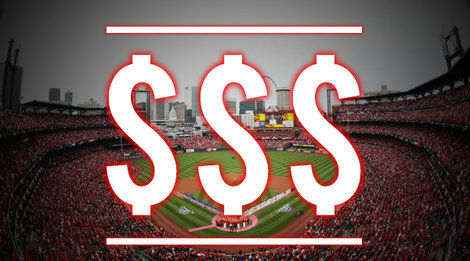 Cot’s Baseball Contracts started out in 2005 as a freestanding website with the URL mlbcontracts@blogspot.com. In 2011 it became a part of the Baseball Prospectus web home. Although much of Baseball Prospectus’ content is behind a firewall, Cot’s remains free. Cot’s home page has links to all 30 Major League teams. In each team’s section you will find a listing for each player currently under contract with the details of that contract and any other contract with any other team the player had signed earlier in his career. These details include salary, options, vesting information, performance bonuses, no trade lists and any other compensation, such as deferred payments game tickets, flights for family members and special road accommodations. Cot’s also lists each player’s big league service time, which comes into play for arbitration and free agent eligibility. Contract information for the coaching staff and front office officials are also included when available. In addition Cot’s offers these team-by-team lists of contracts on a spreadsheets, downloadable through Google docs. The spreadsheet format allows the fan a good visualization of a franchise’s salary commitments down the road. Cot’s is also well known for compiling lists of upcoming free agents divided by position, which is great for figuring out which free agents your favorite team should sign during the off-season. 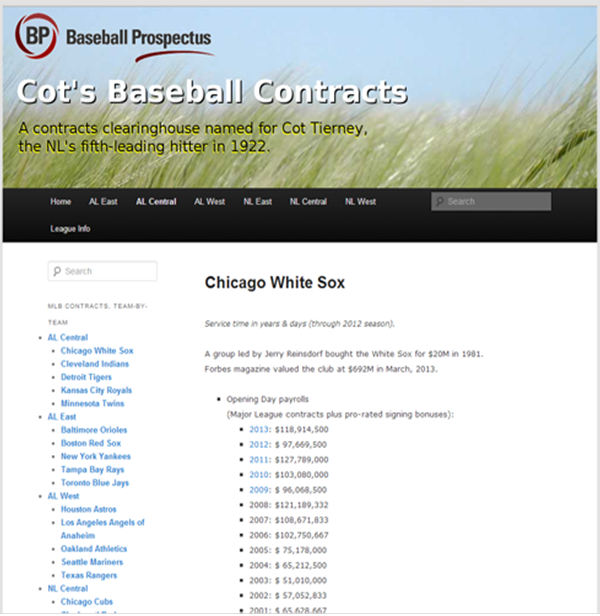 Other features of Cot’s includes salary information for former Major League players who are now playing overseas and a list of the most lucrative current Major League contracts. 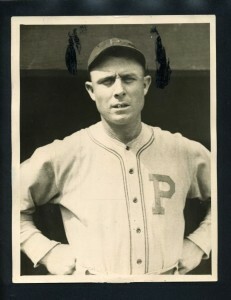 Cot’s information has also been incorporated into Baseball Prospectus’ player cards. This is useful because now when a player retires and is taken off his team salary page there is still a detailed record of what he earned over his career for the curious fan. We certainly recommend checking out BP’s compensation page, which at this point remains free. It is an worthy update to the great work Cot’s did when it was still a freestanding site. However for fans of the old format it should be comforting to know it still exists. If you want to find it just type in the original URL or google Cot’s Baseball Contracts. You will ultimately be on Baseball Prospectus, but Cot’s will look the same as it did before the merger.